Curbing sugar cravings isn’t easy, and chances are you’ll take any suggestions on how to make those pesky cravings subside! Dietician and nutritionist Mary Opfer explains 11 sure-fire foods that will help curb sugar cravings while giving your body the fuel it needs. Whether you have a health issue or not, sugar is just plain bad for you. Many studies have found sugar to have a connection to irritable bowel syndrome (IBS), diabetes, autoimmune diseases, obesity and cancer. And if those aren’t enough reasons to quit, you should know that sugar increases inflammation and encourages yeast overgrowth. Now that you’re convinced you need to ditch the white stuff, I have to tell you that it’s not easy to curb those sugar cravings. Even I, who eat extremely healthy, have struggled with how to curb sugar cravings. The best thing you can do to help sugar cravings is to cut sugar out completely. I recommend a complete detox, which I did when I recently took the Further Food 7 Day Sugar Detox Challenge. At the same time, it is important to add in foods into your diet that can help beat the sugar cravings and keep you full longer. Check out these 11 foods to reduce sugar cravings as well as sugar detox recipes that will help curb sugar cravings and help you reboot your body. Be sure it’s wild caught! Increasing protein will help balance your blood sugar and in turn help decrease your cravings. If you eat meat, be sure to consume grass–fed beef. Try this Pecan Crusted Salmon for a double protein, double omega-3 packed weeknight meal. Turkey provides our body with a key hormone for preventing sugar cravings: serotonin, a chemical neurotransmitter that controls our mood. Scientists have found that reductions in serotonin in our body can lead to sugar cravings and cause us to overeat. While serotonin isn’t found directly in food, the amino acid tryptophan leads to serotonin production in the body. Turkey has high levels of tryptophan that help to promote serotonin production. Pairing turkey with healthy grains can enhance tryptophan absorption and boost serotonin levels-no more sugar cravings. Make a batch of these Turkey Meatballs to beat sugar cravings! This is a “triple-header” of a vegetable regarding sugar balance and a must-add to sugar detox recipes. Kale is a cruciferous veggie in addition to being high in fiber and vitamin C. Just 1 cup boasts 80 mg of vitamin C, which has lots of benefits, including helping to convert and increase serotonin in the brain. Low levels of serotonin can increase sugar cravings, so lots of vitamin C will help increase the serotonin and keep sugar cravings at bay. Add kale to your smoothies for an easy and delicious way to get those vitamins and minerals! Try this easy Everyday Kale and Blueberry Breakfast Smoothie. I love Further Food Collagen Peptides. Collagen peptides are a high-quality protein that is easily added to your shakes, smoothies, stews and soups. It helps curb sugar cravings, restores gut permeability and it is so easy to use. It’s a great way to double up on protein, aid in decreasing sugar cravings and help you feel full in between meals. Add a scoop or two to kale, cucumbers, cauliflower and mix. It has no taste so it won’t change anything. Personally I use it in a veggie smoothie and a side dish made using sautéed chickpeas. Or try this recipe for Collagen Bone Broth – adding extra benefit to this healing broth. These vegetables include cabbage, brussels sprouts, broccoli, and are one of my personal favorite ingredients for sugar detox recipes. These vegetables are high in fiber and aid in removing toxins from the body. Eat them cooked or raw. Spice up taco night with these Brussels Sprout Tacos. Full of b vitamins and perfect for curbing sugar cravings and kicking sugar to the curb. A great source of plant fat, this is a natural high–fiber food. Healthy fats, especially when creating sugar detox recipes, help keep you satiated. They also will help reduce your caloric intake, improve brain function and reduce inflammation. Include avocados in your breakfast, lunch or dinner. Craving sugar? Beat it with this Avocado Mango Nice Cream – no sugar added! Plus, it has the extra collagen boost to keep your skin looking healthy. These can be found in fermented vegetables such as sauerkraut, pickled beets and kimchi. Also try them in coconut kefir. Probiotics are good for immune health and help increase the good bacteria in your gut. Make these Pickled Diakon Radishes and Carrots and eat them in a salad or add them to a banh mi! These are a great source of fiber and can be used to make puddings (and who doesn’t want a sweet sugar detox recipe for a treat?!). They are also high in Omega 3’s, which is a heart healthy fatty acid and protein source. For the morning, make this Matcha Chia Pudding to start your day with a heaping dose of anti-oxidants, vitamins, minerals, and fiber! You’ll get the Omega 3s from the chia seeds, plus matcha helps give you energy and boosts your metabolism! Add some wholesome ingredients and make this detoxifying Two Ingredient Anti-Inflammatory Turmeric Tea Adding turmeric and ginger adds even more nutrition with antioxidants and can help keep away the sugar cravings. Plus the turmeric and adaptogenic herbs help to boost your immunity and beat inflammation. Nuts, especially walnuts and cashews, are high in protein and healthy fats with lots of vitamins and minerals. However, they contain a lot of calories so eat them in moderation, a handful or two a day is sufficient to give you plenty of nutritional goodness. Consider incorporating them in other recipes, like oatmeal or salads, during your sugar detox. Try this Red Cabbage Black Kale Salad with Maple Walnuts and Creamy Avocado Dressing – a triple whammy with the cruciferous veggie, walnuts, and avocado! This will surely keep sugar out of your mind. Black beans, navy beans, white beans, lentils and lima beans are excellent sources of fiber and are an important component of any sugar detox recipes you may want to try! Beans helps regulate blood sugar, making it less likely that you will crave sugar treats after your meal. High–fiber foods also reduce candida symptoms such as brain fog, gas, bloating and bad breath. For a filling meal that can help curb sugar cravings, try these Spice Vegan Black Bean Burgers – sure to curb those sugar cravings away while adding fiber and protein to your day. How to curb sugar cravings? Eat beans like chickpeas that are high in fiber and a rich source of protein. They are versatile and can be used in soups, spreads like hummus, stews and salads. Check out this Low Carb, Low Sodium Beet Hummus – Not only do you get the benefits from the chickpeas but you get tons of anti-oxidants and vitamins from the beets! We know there are lots of reasons to ditch sugar, but cutting out sugar isn’t easy! We’ve tried to help you answer that all important question of how to curb sugar cravings. Add these 11 foods to reduce sugar cravings-they will help you cut out sugar forever and stay healthy! 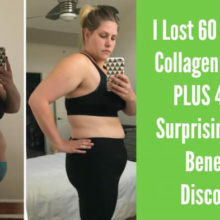 I Said NO to Sugar and YES to Collagen and Then This Happened! Your brain on sugar. It affects more than you think.